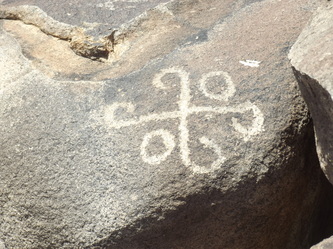 Petroglyphs and pictographs from around the Southwest. A few pics of rock art on granite boulders. The boulder pile is in the shape of a pyrimid but I think it is just a triangular pile of boulders. Local tribal people call the area a "Spiritual Vortex" and the location is very isolated and hard to access. Thanks to my friend Joeseph for trusting me enough to visit this site. 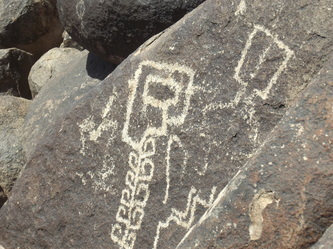 "Petroglyph National Monument protects one of the largest petroglyph sites in North America, featuring designs and symbols carved onto volcanic rocks by Native Americans and Spanish settlers 400 to 700 years ago. These images are a valuable record of cultural expression and hold profound spiritual significance for contemporary Native Americans and for the descendants of the early Spanish settlers." Still snowing here in Colorado, I went out to scout some bucks yesterday (since sheds will be dropping in the next couple months) and found a few patches of snow free hill sides to look at. A couple fire hearths, a flakes but nothing to write about. I was going over a few photos I took of some petroglyphs years back outside Whitewater, CO. I was having trouble identifying the characters on the rock panels and decided to try some photo manipulation. Let me know what you guys think? That is cool. You can tell what is going on too. The hunt is on. Looks like the artwork in the first one is on top of an earlier drawing. That is really neat. I have seen lots of petroglyphs that were near impossible to make out. definitely historic, you think maybe Ute or did they get that far north? In the first set of glyphs, I believe the target-like “bullseye” symbol is the eye of the buffalo and represents “alertness”. The faint tree-like symbol to its left may be the “tree of life”… a symbol for “sustenance”. Antelope top left. There’s clearly a rider on horseback to the left in pursuit mode (and possibly also to the right), so that means the glyphs must be well past the contact period. But the fainter glyphs look to be physically underneath and presumably significantly older. It’s not unusual for there to be “glyphs over glyphs” but I think that generally indicates longer term occupation/presence… ie at least two generations of presence. In the second set of glyphs, I believe the centre symbol is for the rays of the sun, symbolising “constancy”. That’s definitely a branch-antlered animal below and to the left – deer, I would assume. The one to the right of it looks like antelope and the one at the very top looks like a pronghorn. The animal centre right with the big spread feet looks like elk. Another rider on horseback to the left. Don’t see buffalo. Don’t see bows or spears, but the guy at the bottom in the first set of glyphs seems to have his arm raised in a possible throwing gesture. Thanks greg, yep def. some hunting going on! rmartin, I found these south of Grand Junction, which is near the Utah border. The Utes def. 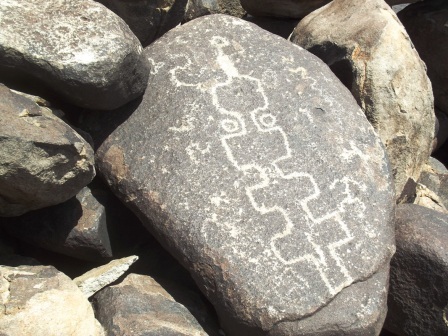 lived much farther North from here, but they were not known for their rock art. There are a lot of Fremont sites in that part of our state, and I've seen several others that looked similar. The mounted rider on the horse is very common in that area, and I have found at least a dozen others. The one with multiple depictions is kind of a "news paper" rock, and it's near a trail head in Domiguez Canyon. That site has had a lot of vandelism, but there are a lot of petros on a single boulder face. My thoughts on the riders, I think they may represent Ute sheep herders? When the Utes were pushed into that corner of the state, the White River agency to the north was the settler's attempts to turn them into farmers. They began herding sheep and were known for their skills in moving herds on horse back. @painsill, the image in the center of the bottom one is a bear paw, also a common motif. That one is my favorite, a lot going on, and they were pecking on top of older ones. Def. a mule deer, a mounted rider, and several big horn sheep or antelope. Reading more widely, it seems that these comments should only be taken as true for the Montana localities on which they reported… and I found images from elsewhere (including Colorado) with up to 8 claws! Here are a couple. The first is a display in the Petrified Forrest Museum (age unknown), the second is historic (probably Navajo) from Coal Bed Canyon, Utah. The Fremont from Utah were some of the greatest artists in this form. This website highlights some of there work in Nine Mile Canyon. I am especially fond of petroglyphs/pictographs as I grew up in Utah, and spent lots of time in southern Utahs red rock country. My sister discovered some cool petroglyphs in Arches National Park (first modern human to see and document) back in the 70s, with me, her little brother, second to see, as I was right behind her. I asked her to send me a pic ( as I don't have a pic), and I will post. There are supposed to be lots in oregon, but i have only stumbled upon the two above. Thanks! Here is a pic of a portion of the petroglyph panel my sister, Anita discovered in Arches National Park, Utah in the 70's, with me, her little brother, right behind her. My father was a Park Ranger at Arches, before I was born. This helped to spark my interest in ancient americans- Anasazi in this case. We call this drawing the "Dragon Monster". Here's a few pics I took on Signal Hill at Saguaro Pk. West, which is north of Tucson. Attributed to the Hohokam NA's from about a thousand years ago.